Consolidation continues to make distributors bigger and fewer while the number of producers grow with new small producers enter the market. The vast majority of wineries in the US produce less than 5,000 cases, and they’ve been effectively blocked from three-tier distribution because distributor giants won’t take them on, but that’s about to change. 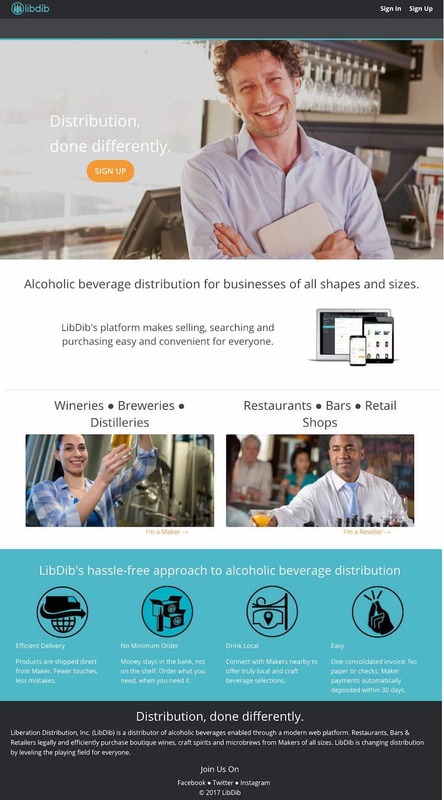 Liberation Distribution (LibDib) today announced the launch of the first web-based three-tier alcohol distribution platform, and it has the potential to impact distribution in a big way. Now any licensed producer that wants distribution can have it. The catch? No catch, just go signup and start selling, and if you later want to switch to a different distributor, you can leave at-will without paying any fees, or fear of franchise law enforcement. LibDib Founder and CEO, Cheryl Durzy, knows the pain small producers are feeling first-hand from her years of experience managing wholesales for her family’s 80,000 case winery, Clos LaChance, and it inspired her to create LibDib. For orders placed through their platform LibDib takes care of all the legal obligations in terms of taxes and reporting, as well as invoicing and collections, while the producer handles shipping and the sales and marketing of their brands. For many small brands handling their own sales was something they already had to do, and with LibDib they’re only charged 15%, less than half of what the average distributor takes. LibDib keeps down their expenses by not carrying any inventory, but shipping everything directly to the retailer as orders are made. The time is ripe for a web-based three-tier alcohol distribution platform, not just because the technology is available, but because of the market trends. “There’s a new niche in the market, that people want unique items, small production, craft, and traditional wholesalers don’t make money on it, so it’s a perfect opportunity to provide this service for people and allow them to ship direct,” says Durzy. Unlike the traditional distributors, LibDib doesn’t rely on any one account or popular brand to make their numbers, but by taking a very small cut out of thousands of individual transactions. As an example, a vegan restaurant that wants to offer vegan wines can go to LibDib.com and search for vegan wines, and in one order get a case each from three different small wineries that no one else in their city carries. And if they know a winery has wine that’s not listed, they can contact the winery directly and ask them to list it for sale.